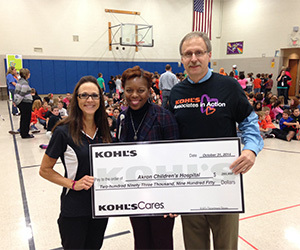 Pete Buzalka, store manager of the Canton Kohl’s, Bernett Williams, vice president of external affairs at Akron Children’s and Renee Manse, principal of Orchard Hill Intermediate display a check from Kohl’s Cares for $293,950 during a fitness rally at Orchard Hill Intermediate School in North Canton, Ohio. Continuing its 13-year commitment to Akron Children’s, Kohl’s Cares® announced its donation of $293,950 during a fitness rally at Orchard Hill in North Canton on Oct. 31. The donation provides continued support of the hospital’s fitness initiative, Kohl’s Fit and Healthy Kids, a program targeted toward local elementary and middle school students. “Kohl’s is very happy and proud to support our community through its Kohl’s Care program and also our Associates in Action program,” said Pete Buzalka, store manager of the Canton Kohl’s. During the rally, children participated in various fitness activities, including parachute games, jump roping, hula hooping and fitness dice. “Because of the help Kohl’s gives Akron Children’s, we are able to come out and help kids stay healthy and stay fit,” said Ameeca Holmes, youth fitness specialist at Akron Children’s. Since 2001, Kohl’s Care® has donated more than $3,824,190 to Akron Children’s for programs that benefit children and the community. Learn more about Akron Children’s Kohl’s Fit & Healthy program.